Free Shipping Included! 22 Inch Super Flexible Silky Herringbone Chain Necklace - 10k - 0.12” (3mm) by SL Chain Collection at SCRHI. MPN: SPRING-030-22. Hurry! Limited time offer. Offer valid only while supplies last. The Herringbone style is designed with interlocked pieces of gold that give it that flow. It drapes luxuriously over the neck and lays nice and flat. The Herringbone style is designed with interlocked pieces of gold that give it that flow. It drapes luxuriously over the neck and lays nice and flat. It is silky and smooth with a gorgeous shine. It closes with a lobster claw clasp. Treat yourself or a loved one; it's a gift that everyone would enjoy in any occasion. Available in several sizes. Note: Herringbone Chains are delicate and need to be handled with extra care; inappropriate use can cause irreversible dents. However, this piece's good quality insures a lifetime use when properly cared for. To keep this silky necklace shining and dent-free, do not wear it during rough work and be sure to store it in a fabric-lined jewelry box or pouch. To clean gold jewelry, use warm water, a mild soap, and a soft cloth, and avoid contact with chlorine and other harsh chemicals. 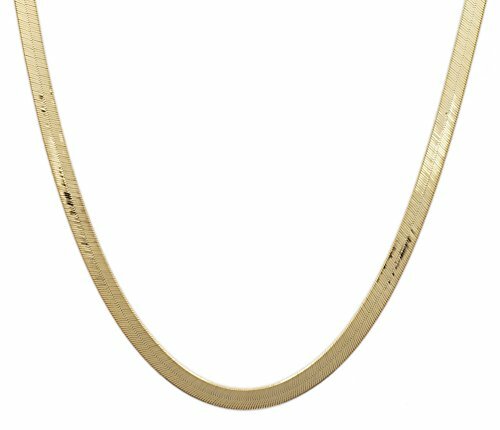 This 10k gold herringbone necklace is available in 5 different sizes, letting you choose the ones that best fit. This beautiful necklace is finished with a lobster claw closure that makes it easy to put on and remove. This herringbone necklace makes a great gift ideas for moms, dads, girlfriends, wives, etc. for all occasions such as birthday, valentine's day, holiday, Christmas, anniversary, or engagement, Shipped in a beautiful gift box. Accents Kingdom Men's Premium Titanium Magnetic Golf Necklace T1 22"